An example of public-private partnership development of a Transit Oriented Development (TOD) project for the San Francisco Bay Area Rapid Transit (BART) District, the West Dublin BART parking structure was built with elevated pedestrian bridges connecting to the new BART Station built in the middle of the existing I-580 freeway. 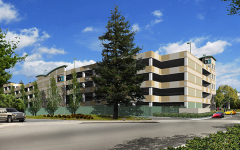 The parking structure has 5 ½ levels, 717 spaces and includes intermodal features such as several bus loading zones, bicycle and motorcycle parking within the garage, taxi waiting spaces, and a kiss-and-ride drop-off zone. Value engineering by IPD to change to a CMU façade instead of pre-cast spandrel panels allowed the project to stay within budget. Special coordination with the Station Design Team was required to accommodate the future pedestrian bridges that were designed and built one year after the garages had been completed.